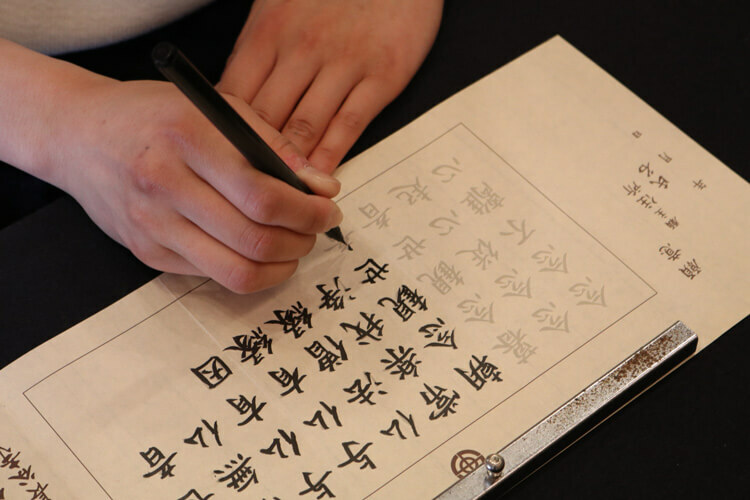 Shakyo is the hand-copying of a sutra. Originally it was started to make the teachings of Buddha spread amongst the people in the old days when there were no printing techniques. 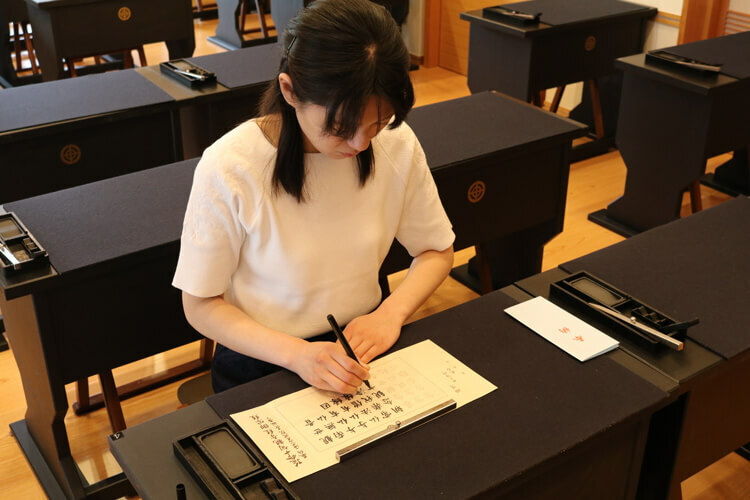 In the time, shakyo has been practiced as a national project and even as a profession. In later years people believed to receive divine favor from deities by making shakyo. Today people practice it to console souls of deceased ones, to offer a prayer or just to have a unique experience. Two types of shakyo sheets are available. En-mei Jukku Kannon-gyo, the shorter one takes about 30 minutes and Han-nya Shin-gyo, the longer one takes 1.5 hours. Shabutsu is the tracing a figure of Buddha. The Hasedera’s shabutsu sheet has a figure of the eleven-headed Kannon, the principal image of the temple. Since the picture is very detailed, it takes about 2 hours to complete. 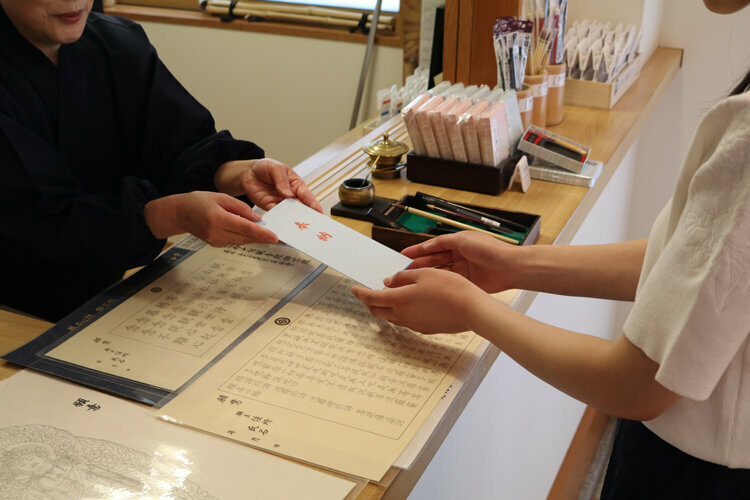 A completed shakyo or shabutsu sheet should be left at the temple, you cannot take it home with you. Please turn off your mobile phone before you enter the shakyo study room and refrain from talking once you are in the room. Photos are not allowed in the site. You can take photos outside of the Shoin hall after you completed your shakyo or shabutsu, if you like. Please take your jacket and shoes off at the entrance. Numbered tags are supplied to find your belongings when you leave. Please pick your sheet from the 3 types and pay 1200 yen for the sheet. An invitation ticket to enter the temple (valid for about 6 months) is included. Please enter the study room behind the reception. Please take a seat and put down your shakyo sheet and belongings. Take your stationary after you visited the altar (please pray with respect). 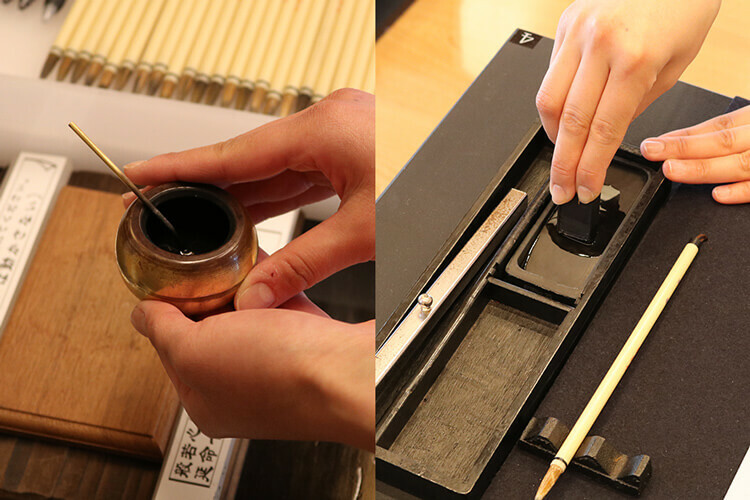 Traditionally, sumi ink is used which you can make by rubbing an ink stick down. But a brush-tip pen is recommended for beginners. It makes it simple to write. 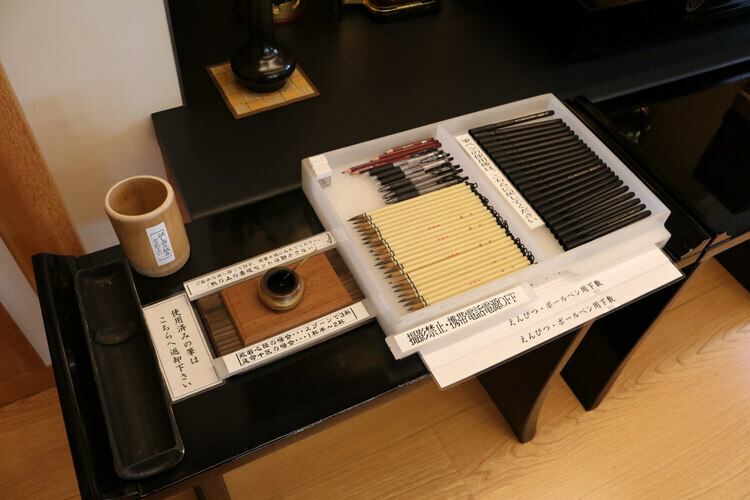 A pencil or ball-point pen can be used for shabutsu sheet. Bring the water pot from the front to your seat and place a couple spoons of water on the ink stone. Please return the water pot, it is shared with everyone. Carefully rub the ink stick down on the ink stone for about 3 minutes. 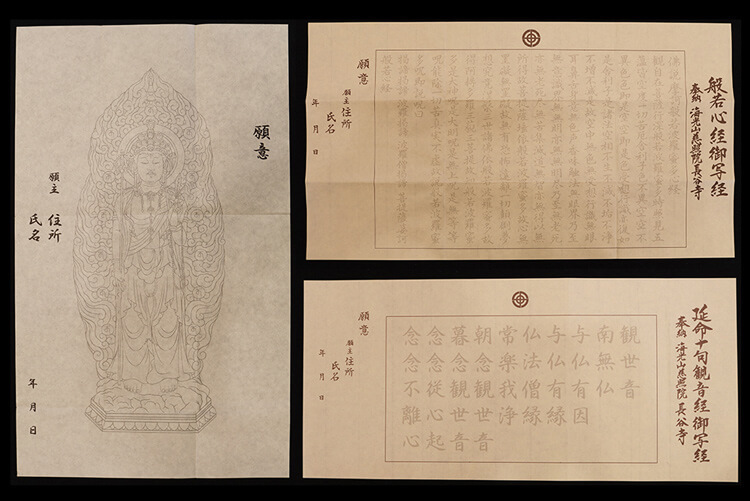 Place a paperweight on the sheet and trace the lines carefully on your pre-printed sutra or figure. It will take about 30 minutes to complete the shortest shakyo sheet. 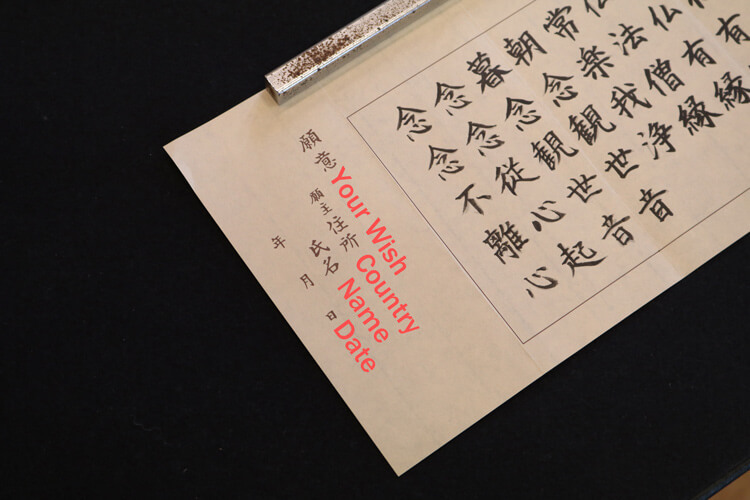 Write your wish, address, name and date. *For this part, you can set the sheet with the right side up if you want to from left to right. 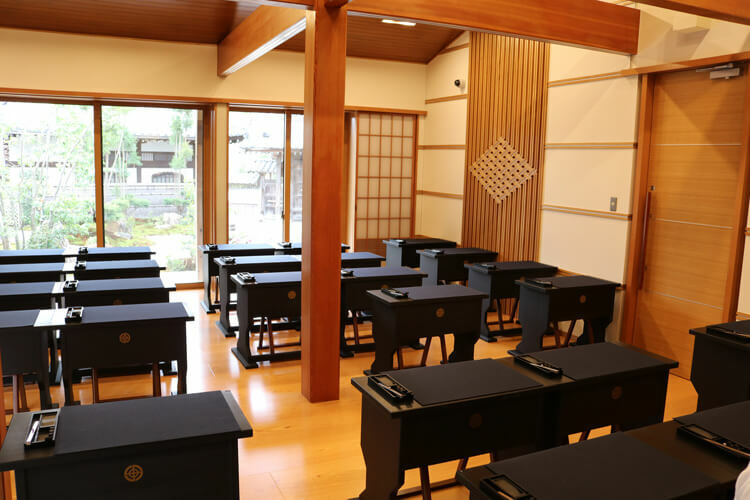 Once you are finished, leave your completed shakyo or shabutsu copy with the cover on the sanpou (small wooden stand) in front of the altar. It will be brought to the Kannon-do hall the following day to give a prayer for you. Return the stationery to where you found it after use.